You can insert a lot of interactive controls in an Excel worksheet using the Excel developer tab. These interactive controls (such as a check box, radio button, combo box, scroll bars) are quite useful when you are creating interactive workbooks or excel dashboards. But there is a possibility that you may not have the Developer tab available in the ribbon. If that happens, don’t panic – and keep reading how to get the developer tab. Excel Developer Tab.. Where to Find it? Don’t worry if you can’t find the Excel developer tab in the ribbon. Since it is not something that most of the beginner Excel users need on a daily basis (some might), Excel team has it disabled as a default setting. Before you can use it, you need to enable it. In this tutorial, I’ll show you how to get the Excel developer tab in the ribbon. Below are the steps for getting it in Excel 2013. While the screenshots are of Excel 2013, the process is the same in Excel 2007 or 2010. Right-click on any of the existing tabs in the ribbon and select Customize the Ribbon. It will open the Excel Options dialogue box. 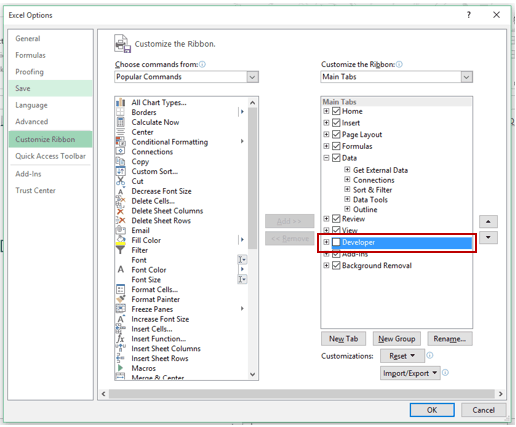 In the Excel Options dialogue box, you will have the Customize the Ribbon options. On the right, within the Main Tabs pane, check the Developer option. Once available, you can use this tab to access all the options within it. 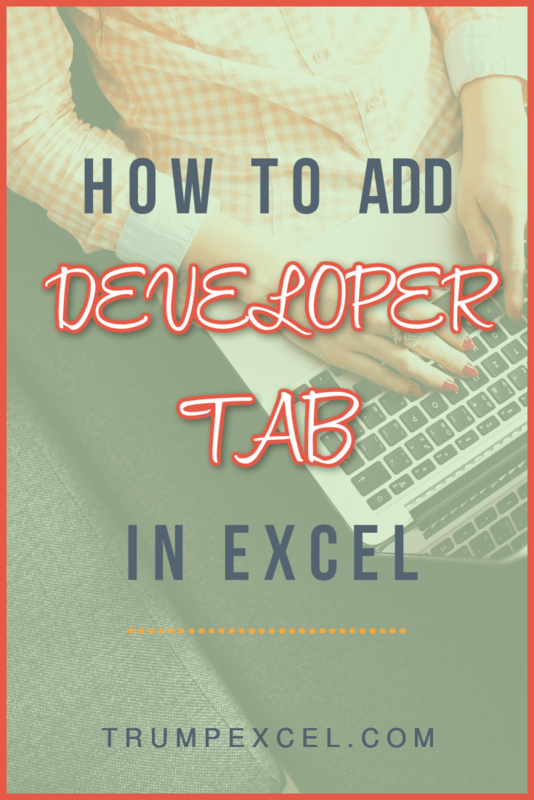 There is another way you can get developer tab in Excel ribbon. In the Excel Options dialogue box, click on Customize Ribbon in the left pane. It will show the Customize the Ribbon options on the right. On the right, within the Main Tabs pane, check the Developer option. This will make the developer tab appear in the ribbon in Excel. The Macro Options: There is a ‘Code’ group in the developer tab that gives you access to many macro options (such as going to the VB Editor, getting a list of all macros in the workbook, record and run the macros, and change macro security. Add-ins: The Add-ins options allow you to manage inbuilt add-ins as well as new add-ins that you might have added. Interactive Controls: The Control group gives you access to all the form and Active-X controls that you can use to insert interactive tools such as a scrollbar, combo boxes, checkboxes, radio buttons, etc. Create Groups in Quick Access Toolbar in Excel. How to get the Developer Tab in the Ribbon Word 2013. Excel VBA Loops- The Ultimate Guide. how can i create a work book for data entry and result upload using excel work.book ?